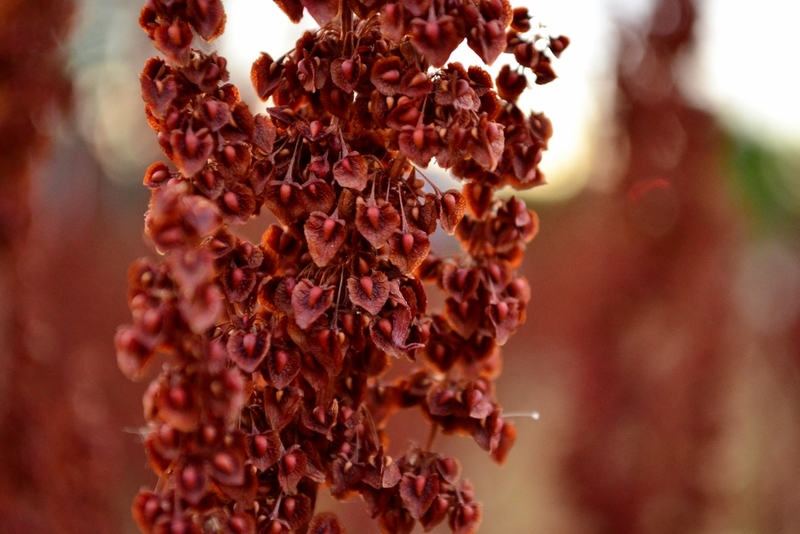 Dock (Rumex) consist of a variety of edible plants found over most of the Earth. Two of the most commonly known varieties is Curly Dock and the Broad-leaved Dock. Typically it’s the vitamin-rich leaves which are most often enjoyed. In today’s article, however, we will consider the use of Dock’s seeds. Dock is both protrusive and wide-spread in its distribution. Therefor one needs not look too hard when on your quest to collect its seeds. 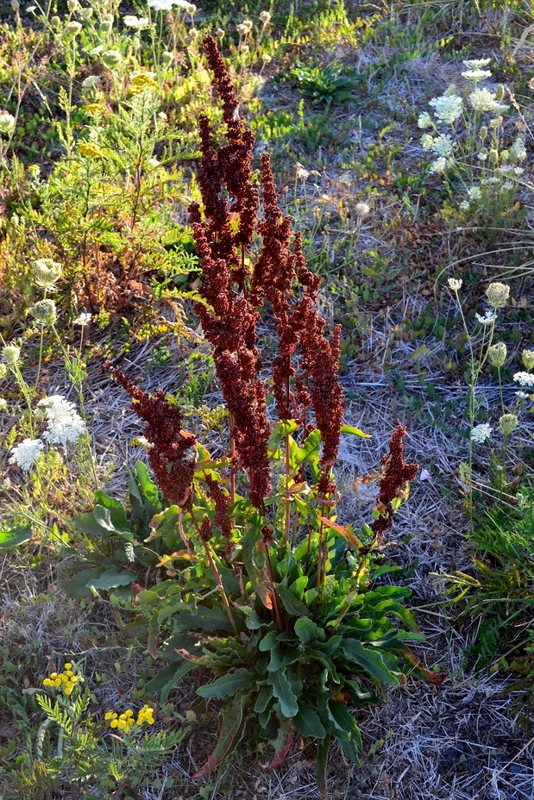 In this case I found a large patch of Curly Dock growing in an empty lot between two businesses. Using a pair of clippers I cut each seed bearing flower stalk near its base. In less than 15 minutes I have harvested enough seed to make a few pints of flour. So I load up my arms and head back to the house. Although some go through a great trouble to remove the papery shells of the seed, I have had desirable results grinding the entire seed product. When the seeds are fully dry as these are, you can quickly remove them by pulling the stem between two fingers, allowing the seeds to collect into a bowl. Be sure to clean away any leaf debris or critters before you start to grind the seed. If you like to work hard for your food or simply enjoy the experience, a mortar and pestle will suffice. I, however, prefer the convenient use of a coffee grinder especially when working with large quantities. One cup at a time I grind up the entire seed into a flour. The flour is then poured into a glass mason jar. 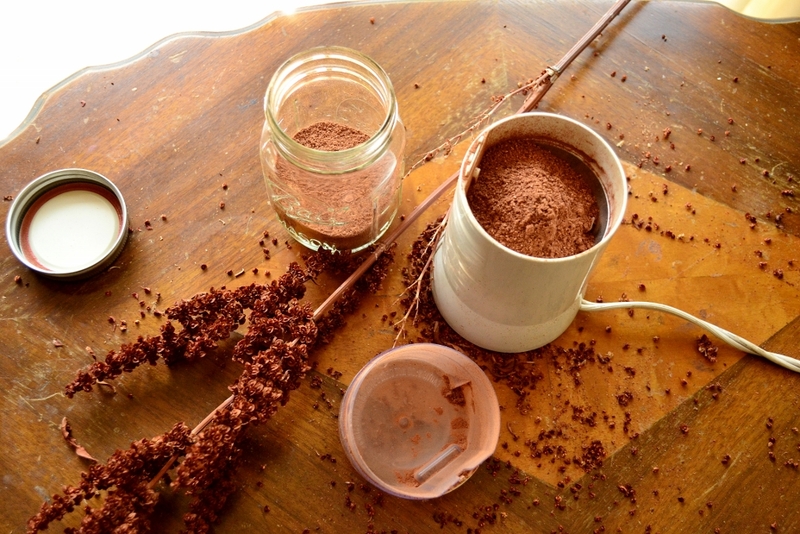 A coffee grinder is a quick and easy way to grind up seed. Grinding only takes a few seconds to turn Dock seed into flour. Once the mason jar is full you may wish to store your flour for future use. Without the lid on, bake jar/s for 1 hour. Place the lid/s on without tightening the ring, and bake another 10 min. Turn off oven and allow jar/s to cool. Once cool, the jar lid should be vacuum tight. Even though the flour wont spoil as it is, this process will help keep its freshness. Now that you have your flour, what will you make with it? Regardless of what recipe you choose to follow, Dock seed flour is a great food additive that’s rich in both fiber and calcium. Be sure to stay tuned for an upcoming article on how to make a Dock seed/Nightshade pastry! Dock seed and Black Nightshade Pastry!